I hope you're a fan of Electronic Arts's current franchises, because you may be playing them for a while. EA's press conference at the E3 expo Monday was severely lacking in new games and series. Still, that's not necessarily a bad thing: EA is bringing some of its most well-known titles to next-generation consoles like the Xbox One and PlayStation 4, though most won't launch until sometime next year. EA kicked off the event with three new titles from PopCap Games: Plants vs. Zombies 2, Peggle 2, and Plants vs. Zombies Garden Warfare. 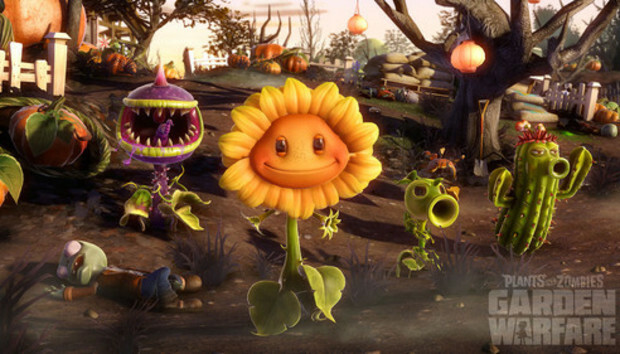 PvZ 2 looks more or less like the original PvZ, albeit with new environments, enemies, and plants. The game will be available for iOS devices starting in July, but we'll probably see it come to other platforms just like the with the original. Plants vs. Zombies Garden Warfare is a third-person shooter set in the Plants vs. Zombies universe. The game pairs Dungeon Defender-like gameplay with the quirky humor the series is known for. You choose to play as one of the plants from the original game, and each plant has abilities that make it fit for specific roles. The sunflower, for instance, acts as the team medic, while the cactus has the ability to more easily snipe enemies from afar. Waves of zombies will attack you and your team, and you can plant additional vegetation for more firepower. PvZ Garden Warfare runs on the Frostbite 3 engine and also features a co-op mode where you and three of your friends can work together to stem the tide of goofy looking undead. The game is coming to the Xbox 360 later this year, but we're still waiting for an exact release date. PopCap also announced the imminent release of Peggle 2--though the team was rushed off stage before they could reveal any more. Next up on the agenda was Need For Speed Rivals, a next-generation racing title that follows the traditional Need For Speed formula of cops versus racers. Aside from looking good, the game features an All Drive mode that lets you effortlessly transition from single-player to multiplayer without the need to fuss with menus. EA demoed the game on the PlayStation 4, but it's highly likely we'll also see the game on the Xbox One. Breaking Bad star Aaron Paul came on stage to briefly talk some about his role in the Need For Speed movie, before EA spent the next 20 minutes talking about its entire line of sports games. There's new editions of Madden, FIFA, NBA Live, and UFC, but those should surprise no one as the company releases a new version of each of these games every year. Let's move on. There were several trailers for games that we would have loved to learn more about, including Star Wars Battlefront, Dragon Age III Inquisition, and Mirror's Edge 2. It's likely that these games aren't far along in development, so we probably won't see them in any playable form until next year's E3. Near the close of EA's briefing, the large TV screens on stage pulled back to reveal 64 people ready to give us a live demo of Battlefield 4's multiplayer mode. While gameplay didn't vary much from previous Battlefield games, the demo did a good job at showing off the game's various particle and lighting effects--both of which drew a number of "oohs" and "ahhs" from the audience. Battlefield 4 is EA's marquee titled at the show, so it's unlikely we've seen the last of this futuristic shooter.